Un jeune sénéglais, Yaro, vit en Italie depuis deux ans. Il fait venir son frère Demba du Sénégal. Quand Yaro se fit assassiner à Milan quelques semaines plus tard, Demba veut comprendre pourquoi et trouver le responsable grâce à l’aide de Théo, l’ami de son frère. Milan, like Paris or Stuttgart, and like many other European cities, is the theater of the drama of immigration. 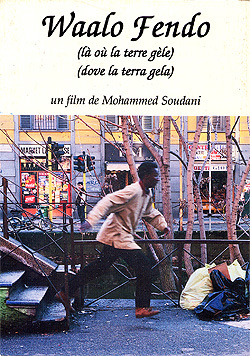 Demba reconstructs his story and that of his brother Yaro, both Senegalese immigrants in Italy, in a long and fragmentary flashback that begins with Yaro’s murder and recounts their departure from the village, arrival in Europe, the work they find selling lighters and picking tomatoes in the south of Italy: the stages every « non-EEC citizen » goes through in Italy. It is a story of immigration like so many others but that most people are unaware of. Waalo Fendo illustrates the dehumanization faced by so many immigrants all over the world. "Je préfère l'espace au territoire"